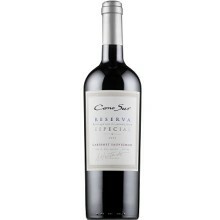 Deep plum red in color, Aromas of ripe raspberries, strawberries, and plums mix well with underlying sweet spices. ​Our Reserva Especial Cabernet Sauvignon goes great with all kinds of red meats, game, hearty pastas or stews and provenzal-styled cheeses: marinated in olive oil served next to crunchy toasts. Grilled pork kebabs, barbeque ribs, and carrot and ginger soup are a few suggestions.